The main experts in advanced manufacturing will meet in San Sebastian from 10 to 12 June. Additive manufacturing and industry 4.0: outstanding topics of the 20 Machine-Tool and Manufacturing Technologies Congress. Terry Wohlers, the North American guru, guest speaker at the Congress. 85 companies form part of the ADDMIMAT association, just five months after its creation. Experts in advanced manufacturing will meet in San Sebastian from 10 to 12 June at the Technological Estate of Miramon during the twentieth Machine-Tool and Advanced Manufacturing Technologies Congress. Additive manufacturing, Industry 4.0, manufacturing systems for the aeronautics sector, robotics and flexible manufacturing or "Zero defects” manufacturing will be the stars of the congress sessions, where manufacturing companies and advanced manufacturing system users will mingle with professionals from technology centres and universities specialised in mechanical manufacturing. The opening of the 20th Congress, which will be chaired by the Lehendakari, Iñigo Urkullu, on 10 June next, will include a Keynote Speech by the world expert in Additive Manufacturing, Terry Wohlers. Wohlers has been a world benchmark in Additive Manufacturing for the past twenty years, with the yearly publication of the well-known “Wohlers Reports: Trends. Analysis. Forecast. 3D Printing and Additive Manufacturing State of the Industry”. The Industry 4.0 concept will also play an important role in this year’s congress. The basic notions that uphold this new concept will be presented in the session of the Friday, 12 June, and the facilitating technologies that are going to bring us closer to industry 4.0, such as robotics, Big Data and data processing, embedded systems and sensors, or visual computing – which refers to the visualisation and simulation mechanisms – and man-machine interface will also be reviewed. 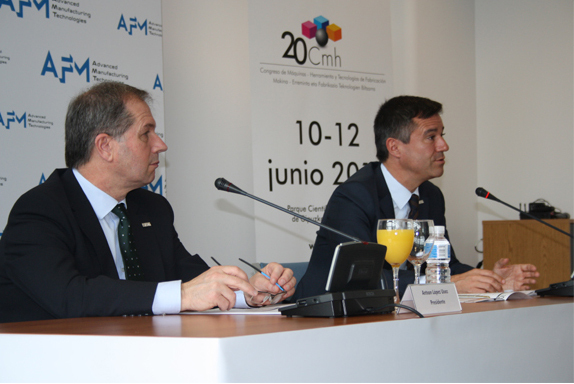 Furthermore, AFM has presented its new association, ADDIMAT, Spanish Association of Additive Manufacturing and 3D Technologies, whose first general meeting was held on 28 May at the BEC within the framework of the 2015 Subcontracting Fair, at which ADDMIMAT had an exhibition area especially given over to additive manufacturing. This new initiative of the dean of industrial associations has permitted, through a spin-off, the incorporation of 85 companies into ADDIMAT in just five months. The objectives pursued by ADDIMAT are to defend the interests of the sector, support the growth and competitiveness of the sector, favouring cooperation among its members and the large advanced manufacturing family. The companies, BEC, DANOBATGROUP, EGILE CORPORATION XXI, FAGOR AUTOMATION, GORATU, IBARMIA, IKOR SISTEMAS ELECTRÓNICOS, KONDIA, LEARTIKER, SICNOVA and TUMAKER were elected members of the governing board at the general meeting. DANOBATGROUP, represented by Antxon López Usoz, and current president of AFM, was elected chairman of the board for a two-year period.